Victor Herbert is one of the giants of American culture. As a musician, conductor, and, above all, composer, he touched every corner of American musical life at the turn of the century, writing scores of songs, marches, concerti, and other works. But his most enduring legacy is on a different kind of stage, as one of the grandfathers of the modern musical theater. 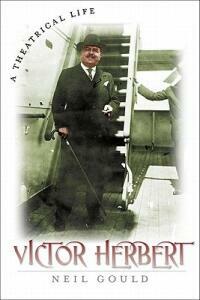 Now, Victor Herbert has the biography he deserves. Neil Gould draws on his own experience as a director, producer, and scholar to craft the first comprehensive portrait in fifty years of the Irish immigrant whose extraordinary talents defined the sounds of a generation and made contemporary American music possible. Mining a wealth of sources-many for the first time-Gould provides a fascinating portrait of Herbert and his world. Born in Dublin in 1859, Herbert arrived in the United States in 1886. From his first job in the orchestra pit of the Metropolitan Opera, Herbert went on to perform in countless festivals and concerts, and conduct the Pittsburgh Orchestra. In 1894, he composed his first operetta, Prince Ananias, and by the time of his death in 1924, he'd composed forty-two more-many of them, such as Naughty Marietta, spectacular Broadway hits. Along the way, he also wrote two operas, stage music for the Ziegfeld Follies, and the first full score for a motion picture, The Fall of a Nation. Gould brilliantly blends the musical and the theatrical, classical and popular, the public and the private, in this book. He not only gives a revealing portrait of Herbert the artist, entrepreneur, and visionary, but also recreates the vibrant world of the Herbert's Broadway. Gould takes us inside the music itself-with detailed guides to each major work and recreations of great performances. He also makes strong connections between Herbert's breakthrough compositions, such as the operetta Mlle. Modiste, and the later contributions of Rudolf Friml, Sigmund Romberg, Jerome Kern and other giants of the musical theater. As exuberant as Herbert himself, this book is also a chronicle of American popular culture during one of its most creative periods. For anyone enraptured by the sound of the American musical, this book is delightfully required reading.